The 1989–90 Primeira Divisão was the 56th edition of top flight of Portuguese football. It started on 20 August 1989 with a match between Chaves and Penafiel, and ended on 20 May 1990. The league was contested by 18 clubs with Benfica as the defending champions. 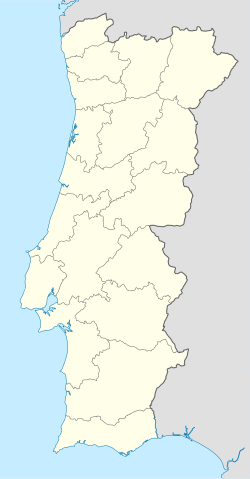 Porto qualified for the 1990–91 European Cup first round, Estrela da Amadora qualified for the 1990–91 European Cup Winners' Cup first round, and Benfica, Sporting CP and Vitória de Guimarães qualified for the 1990–91 UEFA Cup first round; in opposite, Portimonense and Feirense were relegated to the Liga de Honra. Magnusson was the top scorer with 33 goals. Espinho, Fafe, Farense, Leixões and Académico de Viseu were consigned to the Liga de Honra following their final classification in 1988–89 season. The other five teams were replaced by União da Madeira, Feirense and Tirsense from the Liga de Honra, as the league dropped from 20 to 18 teams. ^ "Primeira Divisão 1989-90 – Top Scorers". Footballzz. Retrieved 7 June 2015. This page was last edited on 22 January 2019, at 20:47 (UTC).